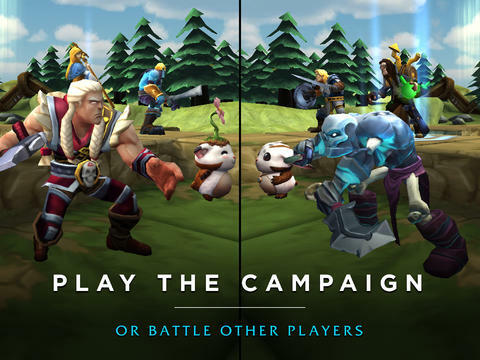 The Champs: Battlegrounds iPhone, iPod Touch, and iPad app combines elements of chess, Pokemon, and tower defense into a challenging and addictive game. The medieval-meets-fantasy graphics, crisp interface, and responsive gesture controls create a cool game scape. The object of the game is to move your army of squires, vagabonds, sorcerers, and super-powered critters around a board and battle it out with special powers and skills you select simply by tapping the screen. The Champs: Battlegrounds iPhone app has an extensive tutorial process to help you get the feel of the game. The story behind the game and tips are presented by voluptuous females who pop up on the screen. Generally, all characters can hack at the opponent with the sword, but they all have some unique skills that add dimension to the battle. Like Pokemon, each character has a different weapon, shield, or technique that can enhance your ability to defeat your opponent. Some characters may be able to add health, perform magic, and use weapons with greater range and effectiveness. As in chess, each character can move on the battle board in a specialized way. The Champs: Battlegrounds iPhone app home screen is streamlined and efficient. In the top center of the screen, you select army, play, or store. To build your army, you move to a new screen with your army displayed. You touch recruit new champ, and a matrix of all of the characters available is presented. You get the details and skills for each character by tapping the screen. The more complex and greater skill set of a character, then the higher price tag you must pay from your earned points or through in-app purchase. When you touch play, the screen is organized well. The levels are in a list on left side, and the PVP battle, training area, and challenge a friend options fill the right side of the screen. You must move step-by-step through each level to access the next round of battles. The game screen is a multi-level chess board. Your team starts on one side and the opponents on the other side of the screen. You can zoom in by pinching the screen, or expand out by performing the opposite hand gesture. The levels of the battle board add a layer of complexity, as your characters’ range may be inhibited by their position near these obstacles. 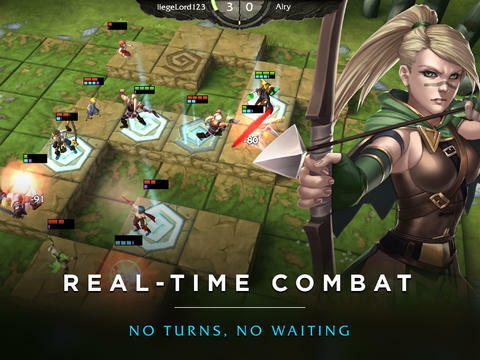 The gesture controls for the Champs Battlegrounds iPhone app are reminiscent of tower defense games. You touch your character, and the choices for movement are highlighted. You touch the square where you want to move your character, and it moves. Just above each character you touch, you will also find a gauge of health and skills available. You touch the skill, and then touch the opponent on the screen where you want to use that skill. If you select a skill and you cannot use it on the opponent, a small pop-up explains the problem. The game play continues in this instance, so selecting the wrong skill can cost you time and another one of your characters could be under attack. Characters can also respawn, so you may defeat one opponent just to find yourself in another battle. The multiple taps, skill sets, and constantly regenerating characters add an unexpected complexity and challenge. You earn points based on the quantity of damage to your opponent, the damage your opponent struck to your team, and which team killed the specific number of players quickest. The Champs: Battlegrounds iPhone, iPod Touch, and iPad app is a free download from the iTunes AppStore that is smart and fun. AppSafari review of Champs: Battlegrounds was written by Jenni Ward on September 24th, 2013 and categorized under Action, App Store, Free, Fun, Games, iPad apps, Strategy, Tower Defense. Page viewed 4299 times, 1 so far today. Need help on using these apps? Please read the Help Page.